Bite Marks (originally known as House Plant) is one of Orbulon's microgames in WarioWare: D.I.Y. and one of Wario Deluxe's microgames on WarioWare Gold. The point of the game is to break the correct pieces of rock to make the house fit perfectly. 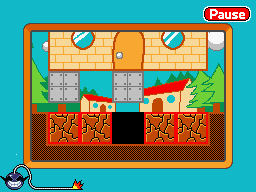 When the game starts, a house with three steel blocks slowly fall from the sky. The player's job is to destroy the ground directly under the steel blocks. If the player manages to do this, the game is won. However, if the player accidentally destroys the wrong piece of ground or doesn't destroy enough pieces, the game ends in a loss. 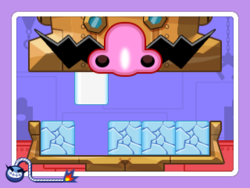 In WarioWare Gold, the design is changed, and the player must now allow teeth on a robotic Wario head to fit into the gaps. 1st level difficulty: Only one block has to be destroyed to fit one tooth. 2nd level difficulty: Two blocks have to be destroyed to fit two teeth. 3rd level difficulty: Two blocks have to be destroyed to fit two teeth. Some blocks must be tapped twice for them to break. This page was last edited on October 12, 2018, at 20:47.